HBGames.ORG • View topic - GREEN 2: RED - Updated 9/3/12! HBGames.ORG » Games » Games in Development » GREEN 2: RED - Updated 9/3/12! GREEN 2: RED - Updated 9/3/12! Player 1: WASD to move! Player 2: Arrow keys or 2468 on the numpad to move! Collect as many COINS as possible! Avoid ORANGE and the SPIKE TRAP at all costs! Hit the WHITE revival tile ASAP! LIVES and COINS shown in the corners! RED is a continuation of the development that went into theory's old RMXP game, GREEN. Where that game fell short due to the constraints of RPG Maker, this game aims to shine as something significantly better. However, RED is not GREEN. 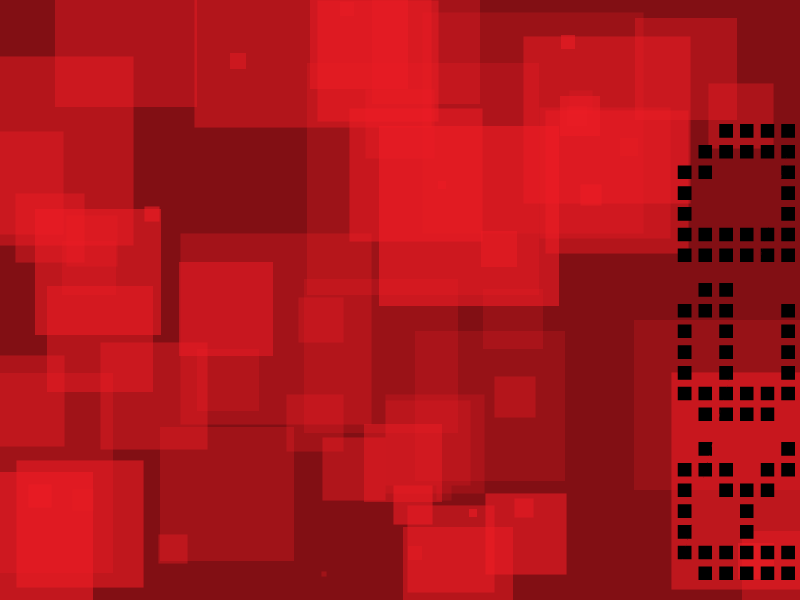 In this game, you start off as RED, rather than the more familiar GREEN. He has different abilities, a different color, but the same goal: to survive as long as possible, and to collect more treasure than ever before. If you find a bug in the game, and would like to report it, you can do so here. If you do so, I would like to ask that you first check to see if one of the open issues on the tracker reports the same issue. If it does, but you have more information on what you did to cause it, please post a comment on the existing issue rather than making a new one. If you have nothing you can add to the existing issue, please avoid unnecessary posts in the tracker. I would also like to mention that I will keep any bug reports open in the issue tracker until I update the hosted game to patch them, rather than closing them as soon as I fix them in the code. While this results in more work for me (I have to manually reopen them after I mention them in a change, then close them again later when I update the hosted game), it means less work for you when trying to report a bug. I would like to thank anyone who takes the time to report a bug in the tracker, especially if they can document the cause, because that makes it significantly easier to give you guys a newer, better game. Fixed a bug causing the game to repeatedly change maps when all players are at 0 remaining lives. Fixed a bug involving players changing maps several times when a new map is loaded. Moved the player management code out of the Player object and into a new Manager object. Created a public repository for the project. Created a public issue tracker for the project. Licensed the project under Creative Commons - Noncommercial due to some of the music used. Added a formatted README.creole file for Github. Added a plaintext README.txt file for other use. Modified the revival god-mode timer to be independent of frame-rate. Fixed issues regarding disappearing icons on the Help screen. Fixed the repository so that it did not include backups, databases, or uistates. Fixed a crash in a specific situation. Fixed several bugs involving players not being placed when the map loaded. Fixed a few bugs where players would load with a map despite being dead. Fixed player placement based upon map orientation. Deprecated a few unused variables. Set sound effects to preload with the game. Updated map exits with new values to assist in placing players properly. Cleaned up the event sheet. Fixed minor issues involving return values and music. Fixed a massive processing time leak that would eventually result in the game spending the vast majority of its power and time processing the list of players in the manager object. Moved back to Dreamhost, since it's stable again. Added a new mob, the Spike Trap. Easily avoided, but it will have a special purpose once I finish the behaviors. Updated the travel system so that you end up on the side opposite the one you exited. Now all players must hit an exit tile to leave the map. Revival tiles are now fully functional! The project is officially at five events. When you enter a map, the door is barred behind you. Kicked players back to the title screen when they lost. Fixed a bug where you respawned in the wrong place when all players died. Fixed a bug where gates you didn't take were sometimes blocked. Fixed many minor bugs that I've forgotten to count. Temporarily moved back to Dropbox due to Dreamhost downtime. Set up a Twitter feed for the project. Set up a Facebook page for the project. Hosted the project on my own servers. Created a userbar for the project. Created a banner ad for the project. Removed the annoying background music from the project. Added revival tile sound effects. Added revival tile sound effect. Added player revival sound effect. Made it so that if all players die on a map without activating the revival tile, a new map is loaded. Made it so that if a new map is loaded for revival, all players are next to the revival tile. Made it so that ORANGE can kill the player. 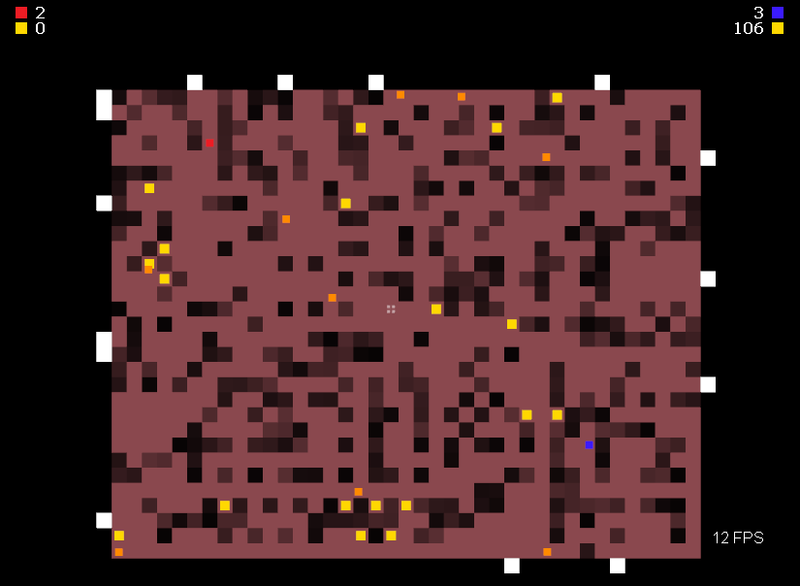 Reduced the number of ORANGE on the map using a randomized check on load. Made it so that all players are temporarily invincible upon the respawn of a player. Added sound effect for collecting coins. Added new effect to make player locations more obvious. Paused most behaviors while the new effect was active. Added more enemies to demo maps. Gave ORANGE the ability to charge at the player. Added flashing prompt on title screen. Last edited by Glitchfinder on Mon Sep 03, 2012 11:43 pm, edited 22 times in total. I agree with Jason. Or even if not tile based, you can use the "90 degree" option in the 8-direction behaviour setting. The moment will still be smooth but the angle is fixed to 90 degree turns, and it will still adjust automatically if you try to roll over a corner or squeeze through narrow bends. A bit laggy on my work computer using Firefox, but my work computer is trash (it was supposed to be upgraded last year -_-). I've certainly been thinking the same thing regarding tile-based movement. I'll definitely look into it, because as it stands, I don't really like the current movement schema. My only qualm regarding setting it to tile-based is in regard to a few of the planned open map types, where movement being limited to tiles will make it significantly more difficult to avoid your enemies. That said, I think that if I manage to implement it (it's harder than it seems to do that!) I'll probably end up keeping it for simplicity. The best part is, if I do it right, I can set it to tile-based only on maps like the maze map you start on. Actually, the movement that I'm using there is a heavily modified version of the default movement you're talking about. I had to make some significant changes, most notable being the fact that you now move relative to the screen rather than relative to the layout. (Try rotating a layout by 90 degrees and then moving in it using the default movement) That said, even in the default version, the 90 degrees option is specifically for the sprite rotation. There is a four-way option, but it was significantly more annoying for me to use than the 8-way I'm currently using. I'll probably have the same problem with tile-based movement too, in that it doesn't feel very intuitive to only go one direction at a time, even when you should theoretically be moving more than one. (For example, I'll have a tough time making it so that if you're holding up and right, and hit a wall, you slide right instead of up. The default behavior has the exact same issue, to boot. That said, I could probably keep the 8-way while still making it tile based. It shouldn't be too difficult to do, I think. But I have yet to try, so I don't really know for sure. Edit: I just realized EXACTLY how to do it. I know that pac-man is NOT tile-based, and I was remembering how they implemented it when I realized exactly how to do it for my game. It's pretty simple, and I'll mod the demo to include it in a minute, as soon as I work it out. It would basically amount to forcing you down the center of a lane, and not letting you change direction unless a tile in that direction was open, and you would still remain in the center of that lane too. I'll make it so that the last button pressed is the current direction of travel, but in the event that you hit a wall, it reads any other pressed buttons to see which way it should go. Hmm, I'm not particularly sure how to fix this issue, to be honest. At least, how to fix it while keeping a dynamic character speed. That said, I would like to note that there is no friction while you are touching something, so you can easily slide along the side of a wall with no issues. I am going to see what happens if I make the player a bit smaller, though. Anyway, I already know to expect a lot from you, so good to know you won't disappoint! All right, to accommodate the movement issues, I made the characters smaller. It's not the best fix, but it's far better than the buggy stuff I tried before that. I also added more copies of ORANGE to most of the maps, to give a slightly better example of what you can expect to see ingame. Anyway, what do you guys think of the rest of the project, aside from movement? Jason already commented on the camera, but what do you guys think of the title screen? The pause screen? The game in general? I didn't see how to start the game when I was at the title screen, so I was confused until I hit an arrow key. Some indication would be awesome. I love the multiplayer feature. In fact it also contributes to one hell of a single player experience trying to control both at once. The walls and floors can use more contrast to differentiate each other, unless you meant for the walls to look similar to floors in order to blur the player's sense of direction? Looking forward to playing this one definately. Thanks for the bit on multiplayer. I had tried that myself, but stopped when I realized it was taking too much from the testing. One thing I would like to note is that when this reaches final release, it will start with just RED. It will be up to some lucky player to unlock INDIGO for everyone. Yes, that's right. This game will have unlockables. And not just unlockables, but global ones, that everyone shares. Ideally, it'll also have an online stats page that immortalizes the players that unlock stuff. What's this? A compliment from BlueScope? I'm going to have to look out my window in a sec, but I'm pretty sure that's a sign that the end is nigh! Sorry, couldn't help it. You're pretty stingy with compliments when you could be giving constructive criticism instead, so it's kind of rare to see anything that could be taken as one. Thanks for posting, and I look forward to when you can tell me what you think of my progress. Thanks for the language hint, I indeed had no idea ^^"
Bluescope, I think she was responding to my asking comments on the title screen. Anyway, I just added a few basic updates. First and foremost, a VERY basic HUD, so you at least know how many coins you've collected. The lives are still nonfunctional, though. (It's a quick update, but I'm not doing it yet) Second, I added placeholder blinking text on the title to tell people how to get past it. I'll bug theory for a better image to put there later. Also, has anyone paid attention to some of the finer details? For example, the squares on the title screen are in random locations, and the background in-game is somewhat random, although it tends to be blue. Ah, my bad then... ^^" My apologies. I'd suggest a camera zoom-out, but as you got two players, you'd need to do something else. Maybe the sprites scaling down from 500% in the beginning, looking as if they "fall down"? Well, dunno if that's the perfect solution... just something to tinker with maybe. The moving-around-corners thing is something you might want to improve still... it wasn't anything as hard as I expected it to be from the comments, but I'm having a hard time getting the character to do exactly what I want. And you might consider changing the title screen's text color to white, or something less bright than that and still better readable than black. Also... your characters are pretty square. Smile, you never know when you are on camera! As for the moving around corners bit, I'm having a great deal of trouble with that. Short of changing the shape of your character I am going to have a lot of trouble making it work just right. The problem is, changing the actual shape of the character isn't really an option, and varying the shape of the hitboxes just makes it even more confusing. At the moment, I have no idea how to make it effectively run on rails with the same ease that pac-man did, which leaves me with very little in the way of options to work around it. Regarding the title screen, I considered it, but I'll definitely want to ask theory about it before I do anything, because he's the one who did most of the title screen, and I'm far less visually inclined than him. Finally, I'm glad you liked the demo, and I hope my additions make it even more fun! And yes, your comment on the characters was quite punny. We used to do this on a regular basis. About half the scripts in my signature, as well as most of the ones he posted, were, to some extent, a team effort between the two of us. We work quite well together. All right, I just made a minor update to the demo. It incorporates BlueScope's suggestion regarding locating the players, as well as a new sound effect. Now you can actually hear yourself collecting coins! It's so rewarding! Next up is adding the next enemy and making players actually die. New sound effects will come with that stuff, too. It's pretty cool so far. The camera works wonders so far. It is pretty impressive. The gameplay/graphics are pretty neat too. The style just...fits. It matches the theme of the game (at first I thought it was Dwarf Fortress or something though so a tutorial would be nice). The only thing is, what's the goal of this thing, exactly? It got kind of boring later on. And once I got dropped into a random pit of blue. Then I went all the way up (read: all the way up) and found a teleport. But other than that, pretty sweet. I love the AI too. Thanks for the compliments! A tutorial will be accessible from the selection screen, which will show up after the title screen in the future. As for a goal, I mentioned it in the main post, but I guess I'll reiterate: Survive as long as possible, get as high a score as possible. Pretty simple, but it will be quite challenging, especially once I finish up player deaths/respawning. (I've currently got player death, I'm working on the respawn bit right now. One thing I would like to note is that respawning will not be a matter of just wait for a respawn. If you activate the spawner on the current map, dead players can respawn there after five seconds. (If they died before the spawner was activated by another player, then they'll still have to wait another five seconds) If all players on a map die, but at least some have lives left, then a new map will load, with the spawner already active, and the players will appear around it. As for the big blue map, that's actually an empty map I have yet to finish. It's set to become a treasure map. At the player levels calculated for in the current demo, that means that there will be lots of treasure, and no enemies. Also, the map isn't always blue. The maps are actually all green in the editor. It's not until you start a map that its color is determined. They just tend to be blue because blue is the last color handled. Player death, complete with sound effect. Player respawn tile. This has no behavior yet, though. Respawn tile behavior and sound effects. Respawning on a new map if no players survive the current map. Kicking players to the title screen when all lives are gone. I would also like to note that, by now, this would be over 100 events if I was not using custom behaviors. In point of fact, the current project would be at 45 events right now if I had been using global variables rather than data stored inside an array. Edit: The rest will have to wait for tomorrow. I got caught up on a small issue that proved quite annoying. Specifically, upon the death of a player, the camera "snaps" to the other player. I know how to fix it, though. It's pretty simple. I made a new object, one that the camera treats as a player, but has no sprite. When a player dies, they spawn one of these at their location. When this is created, it picks the first player in the player array and moves toward it. As that happens, the camera scrolls toward the remaining player, rather than simply snapping. Once it actually collides with the player, or if no players are on the map, it despawns again. Unfortunately, I have no time to implement that tonight. Wow, I really like the concept behind this one. I think the visuals lend themselves well to the gameplay concept. In fact, I've got a number of game ideas I'm working on right now that have very much the same blockish appearance, but my hope is to keep the graphics simple but make the gameplay immensely deep, sort of like a roguelike. It seems to me you're going that exact route with this and it seems to be coming along great. I'm very interested in the progress on this, especially given the roguelike nature of it. I've always loved roguelikes and played Rogue, Nethack and Moria around the time they were first circulating BBS systems. Looks like you've got the random levels done well on that note. They seem interesting enough to me to maintain interest. Plus, the way the monsters chase you works very well given the hybrid roguelike/realtime gameplay. Given the blockish appearance, how do you envision the sounds best done? I was guessing you might want to go the 8-bit route? If so, there are infinite sources of sound for that. I work with lots of different audio software and I guess I tend to focus more on audio than anything. If you're interested, I can throw some ideas your way. I'd love to see this one progress quickly. I'll respond to your post later tonight, Ugotsta. Unfortunately, I'm short on time before work. Anyway, I just uploaded a new version! Check out the changelog for details, but by now I can guarantee that if I wasn't scripting behaviors, I would be at more than 100 events. Kind of odd, considering how simple the game is. Unfortunately, I didn't have time to script it to kick you to the title screen after all lives were lost, so you'll have to be content with refreshing for now. HOWEVER, you can be left on the map with no players but lives left if a revival tile is active. Just wait the for the respawn count and move on from there. All right, I'm sorry for taking so long to reply to this. Thanks for the compliments, they really do help me keep going with this project. As for the sounds, I contemplated using legitimate chiptunes, but was unable to find a site with enough resources that fit what I needed. I am not a composer, nor am I particularly good with audio in general. If you could link me to a site with a large number of chiptunes that are up for a creative commons or creative commons: attribution license, I would greatly appreciate it. Unfortunately, I cannot let myself use anything that's licensed as personal use or royalty free (the kind where you pay up front for use), but that's about the only limit. As it is, I'm using sound effects more akin to synth from the 70's, like you might see in the original TRON movie. I'm not sure how much I like them, so the opportunity to compare would be quite helpful. Again, thanks for the suggestion, and I hope you enjoy the finished product. As for the sounds, I contemplated using legitimate chiptunes, but was unable to find a site with enough resources that fit what I needed. I am not a composer, nor am I particularly good with audio in general. If you could link me to a site with a large number of chiptunes that are up for a creative commons or creative commons: attribution license, I would greatly appreciate it. Unfortunately, I cannot let myself use anything that's licensed as personal use or royalty free (the kind where you pay up front for use), but that's about the only limit. Also your game is not subject to being forced to adhere to commercial use requirements. You're not selling it. The song in the title is amazing and awesome ... But the ... BGS??? That plays during the levels grinds on my nerves after a short time. Really needs to be replaced by music or something less ... Irritating. I totally agree with you on that one. In point of fact, lemme update that right now. There was something I was considering replacing it with, and I think it's time to do so. Edit: nvm, that totally didn't work. :/ I'll just take out the current bgs for now. Just hit the four white squares toward the center of the map.